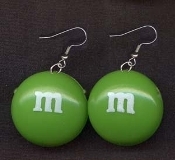 Funky Huge m&m EARRINGS - Chocolate Candy Treat Junk Food Snack Charm Novelty Costume Jewelry - GREEN - SMALL - Big hollow plastic charm, approx. 7/8-inch (2.19cm) diameter. You know what they say about the GREEN ones!